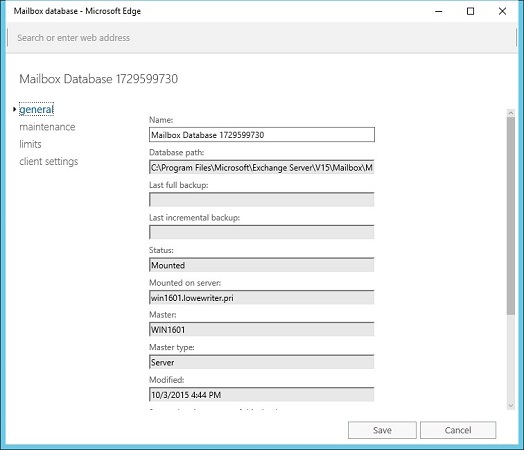 Exchange 2016 lets you set a limit on the size of each user’s mailbox on your network. In a very small organization, you can probably get away without imposing strict mailbox size limits. If your organization has 20 or more users, though, you need to limit the size of each user’s mailbox to prevent the Exchange private mail store from getting out of hand. Issue Warning At: When this limit is exceeded, an email warning is sent to the user to let him know that his mailbox is getting large. Prohibit Send At: When this limit is reached, the user can’t send email, but the mailbox continues to receive email. The user won’t be able to send emails again until she deletes enough emails to reduce the mailbox size below the limit. Prohibit Send and Receive At: When this limit is reached, the mailbox shuts down and can neither send nor receive emails. Keep Deleted Items for (Days): Most users don’t realize it, but when they permanently delete an item from their mailbox, the item isn’t really permanently deleted. Instead, Exchange retains the item for the period specified by this limit. The default is 14 days. Keep Deleted Mailboxes for (Days): This limit specifies how long Exchange should retain mailboxes that you delete. 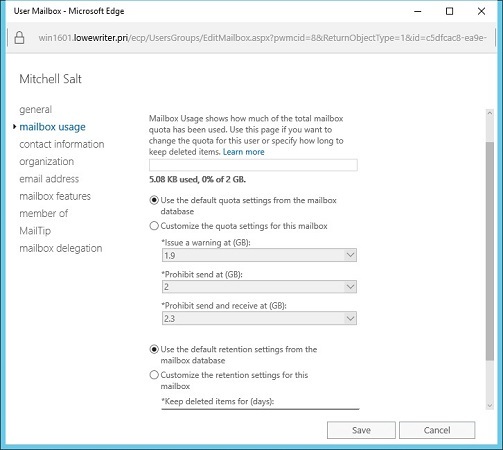 You can (and should) set a default storage limit that applies to all mailboxes in your organization. You can also override these limits for specific users. The limits you set will depend on many factors, including the number of users in your organization, the type of email they typically use (for example, do they require large attachments? 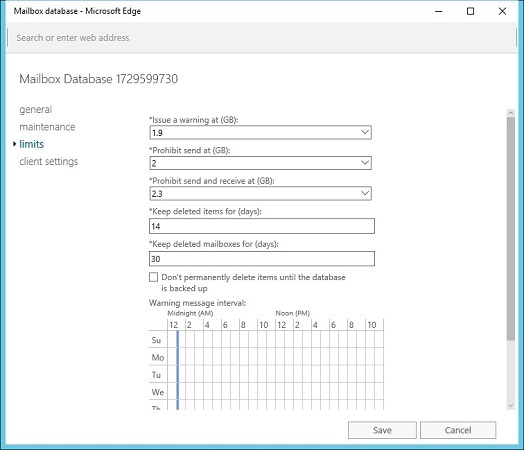 ), and the amount of disk space available on your Exchange server. In the Exchange Admin Center, select Databases. A list of databases for your Exchange environment appears. In this example, there is just one database. For larger Exchange environments, you may see several databases. 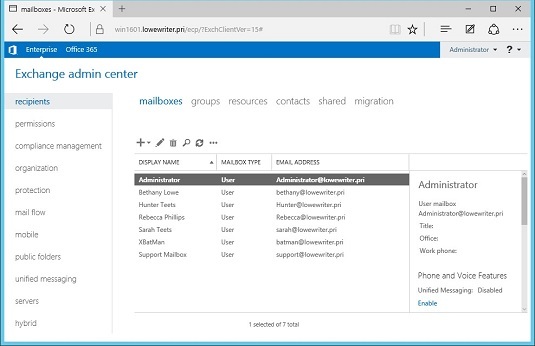 The Exchange Admin Center Databases page. Double-click the database whose limits you want to change. The Mailbox Database page appears. The Mailbox Database Limits page is displayed. The Mailbox Database Limits page. Change the Storage Limits settings to meet your needs. By default, the storage limits are set quite high: Warnings are issued at about 1.9GB, send permission is revoked at 2GB, and both send and receive permissions are revoked at 2.3GB. These limits are generous, but bear in mind that if you have 100 users, your mailbox database may grow to 200GB. You may want to set lower limits. Click Save. The limits you set take effect immediately. In the Exchange Admin Center, choose Recipients, and then double-click the mailbox you want to edit. The user’s mailbox page appears. Select Mailbox Usage. The Mailbox Usage page appears. Click More Options. The mailbox limits options are displayed. Setting the default storage limits. Change the Storage Limits settings to meet your needs. You can adjust any of the mailbox limits up or down to create limits for the user that are either more or less restrictive than the defaults for the database.